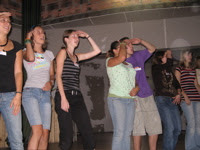 Alice In Poland: English Camp in Wisła, Day One! English Camp in Wisła, Day One! We are done with day one and I am blown away by how our camp is doing! There was an immediate feeling of family and even the discussion groups were great! I am in a group this year and it is a great thing! I even introduced my self and said 7 things about myself IN POLISH!!!! It was great! I will put some pictures up so you can see how we are doing! Many of these happy faces do not happen until later in the week! I am so grateful to God for a WONDERFUL DAY!